Online PDF Splitter offers you a chance to split several PDF files pages online absolutely free. You do not have to install anything on your pc, it\'s safe. You upload your PDF file and get the resulting PDFs in just a few seconds. 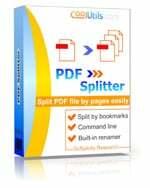 Online PDF Splitter offers you a chance to split multi-page PDF files into pages online absolutely free. You do not have to install anything on your pc, it\'s safe. You upload your PDF files and get the resulting PDFs in just a few seconds. Online PDF Splitter is truly user-friendly. It requires 2 clicks to split any multi-page PDF file. Try it now, it\'s free to everybody. This software offers a solution to users who want to download several images by specific words. The user simply enters the search words, the number of images to be downloaded and the output folder before starting the automation.